If you’re looking for a simple gluten-free dinner recipe to feed your family, look no further than this easy chicken enchilada casserole. It’s comforting, savory and oh so cheesy! You’ll love how easy this casserole is to throw together for a simple and tasty family meal. When the cold weather hits, I start craving gluten free versions of hearty, comfort food. Chicken enchiladas have always been a favorite of mine, and can be easily made gluten-free when you use corn tortillas and a gluten-free enchilada sauce. To make enchiladas even easier, instead of rolling corn tortillas around the enchilada filling, we’re making the EASIEST chicken enchilada casserole. Rolling enchiladas can be a little time consuming and let’s face it… messy. But layering all of your enchilada ingredients into a casserole dish makes everything a bit simpler and just as tasty! Chicken enchilada casserole is an easy weeknight dinner recipe with just a few simple ingredients and minimal steps. All you do is mix gluten-free red enchilada sauce with cooked shredded chicken, sautéed onions, peppers, and corn. Then layer with gluten-free corn tortillas, shredded cheese and enchilada sauce. Bake in the oven for just 20-30 minutes until the cheese is melted and bubbling. Serve with your favorite toppings, like fresh cilantro, sliced avocados or dollops of sour cream. Leftovers reheat incredibly well, too! Shortcuts for Making Chicken Enchilada Casserole Easier! 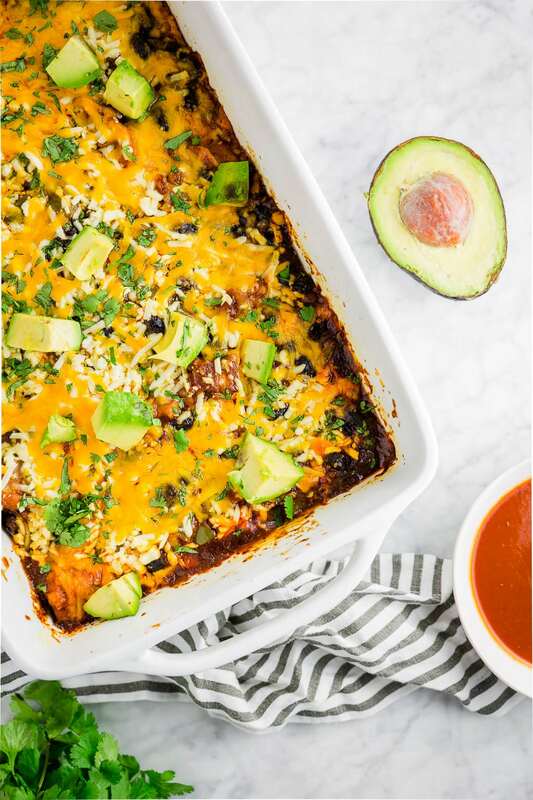 This gluten-free chicken enchilada casserole is so easy to make – it’s great for serving a crowd or for meal prep. This recipe even has options for making this already easy recipe even simpler. You can either cook your chicken breast or thighs yourself or use leftover rotisserie chicken! If you plan on cooking your own chicken, you can make it a day ahead to save some preparation time if you’re making this for your family for dinner. Speaking of make-ahead, you can prepare the chicken enchilada casserole up until baking in the oven and instead cover with aluminum foil and place in the refrigerator for up to 24 hours in advance. 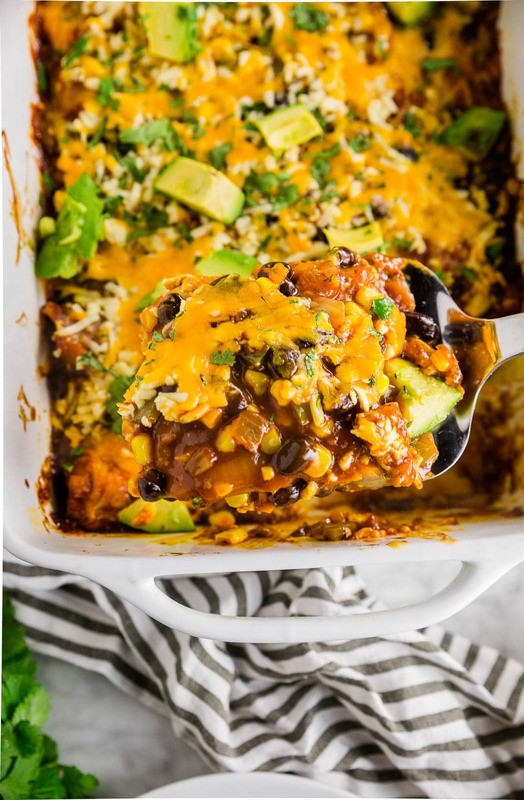 So if you’re making this for a dinner party, all you have to do is place it in the oven when your guests arrive and you’ll have hot and cheesy gluten-free chicken enchilada casserole in no time! Instead of making my own enchilada sauce, I tend to buy it from my local grocery store who has a great selection of sauces, a few of which are gluten-free! Most of the time.. no, enchilada sauce is not gluten-free. Flour tends to be used as a thickening agent in enchilada sauces making it not gluten-free. However, I have found a few gluten-free enchilada sauce brands at my local grocery store that taste great! In this recipe, I used La Victoria Red Enchilada Sauce. Remember, ALWAYS check ingredient labels as brands can change their ingredients or manufacturing practices. Never assume that since a product has been gluten-free in the past that it remains that way. You can also make your own gluten-free enchilada sauce from scratch! Wholesome Yum has a great recipe if you’re looking for a homemade option. 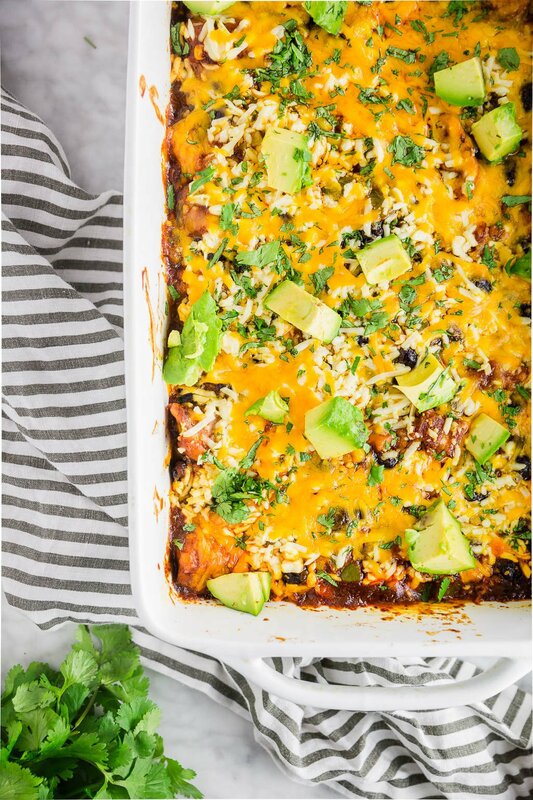 Topped with melted cheddar cheese, diced avocado and fresh cilantro, this gluten-free chicken enchilada casserole is an easy weeknight meal that’s also great for serving a crowd. Made with corn tortillas, this gluten-free meal is so comforting, making it a great option on cold nights. If you're looking for a simple gluten-free dinner recipe to feed your family, look no further than this easy chicken enchilada casserole. It's comforting, savory and oh so cheesy! You'll love how easy this casserole is to throw together for a simple and tasty family meal. Season the chicken with salt and pepper. Preheat a large skillet over medium heat. Add 1 tablespoon of the oil and let heat for a minute or two. Add chicken to the skillet and cook 6-8 minutes per side, until the chicken is cooked through. Remove the chicken from the skillet and place in a large bowl. Shred with two forks and set aside. Add an additional tablespoon of oil to the pan with the onions and peppers. Cook for 5-7 minutes, until the onions are translucent and the peppers are soft. Add the minced garlic to the pan and cook for 1 minute, stirring frequently to make sure the garlic does not burn. Return the shredded chicken to the pan. Add corn and black beans and stir to combine. Cook an additional 1-2 minutes. Stir in 1 1/2 cups of the enchilada sauce, reserving the remaining 1/2 cup for later. Mix to combine. Remove the pan from the heat. To make the casserole, pour 1/4 cup of the remaining enchilada sauce into an 8x13-inch casserole dish. Cover the sauce completely with 1/3 of the corn tortillas. Spoon 1/2 of the chicken mixture onto the corn tortillas and sprinkle with 1/3 of the shredded cheese. Repeat again with an additional 1/3 of the corn tortillas, remaining chicken mixture, and 1/3 of the cheese. Top with remaining corn tortillas, remaining 1/4 cup of enchilada sauce, and remaining 1/3 of the cheese. Bake at 350F for 25-30 minutes, until cheese is completely melted. Remove from the oven and top with sliced avocado and chopped cilantro. Serve immediately. *To shorten the cook time, you can use leftover pre-cooked chicken or rotisserie chicken in this recipe. You'll need about 4 cups. Remember, if you're on a gluten-free diet to make sure your rotisserie chicken is gluten-free! **Not all store-bought canned enchilada sauces are gluten-free, so be sure to check the ingredients.